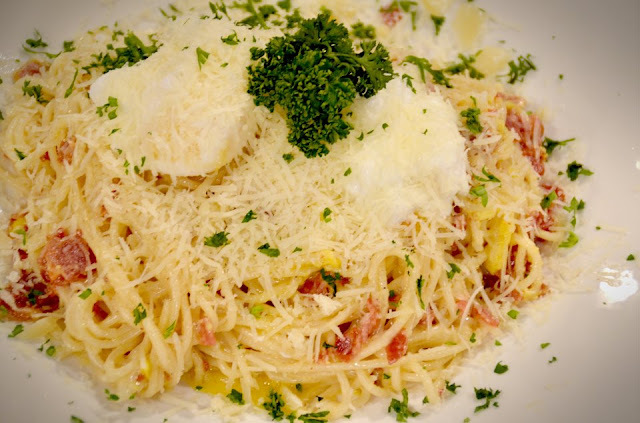 Spaghetti Carbonara is one of the most popular Italian pasta dishes. This carbonara recipe combines cream, eggs, cheese and bacon. 1 Poach eggs and set aside. 2 Fill large soup pot with cold water and add handful of salt. Stir and taste; it should taste like seawater. Cover pot and heat water until it boils. 3 Add diced bacon to a cold sauté pan and cook slowly over low heat for 10 to 15 minutes or until crisp. Remove bacon from pan and drain on paper towels. 4 Drop spaghetti into boiling salted water and cook according to package or until al dente, or tender but still firm to the bite. 5 While the pasta cooks, melt butter in pan with olive oil, combine cheese, and cream. Add dash of nutmeg and simmer. Season with salt and pepper. 6 Drain pasta, toss with cream mixture, then add cooked bacon and chopped parsley. Toss and serve right away, with additional grated cheese if desired. Top with poached eggs.